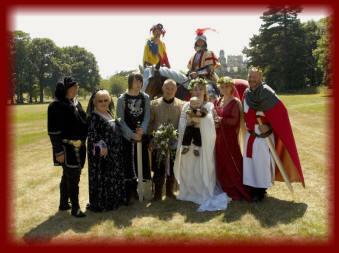 s the sun shone down on Lady Samantha and Sir Colin's medieval fantasy wedding day, they were blessed with the hottest day of the year. 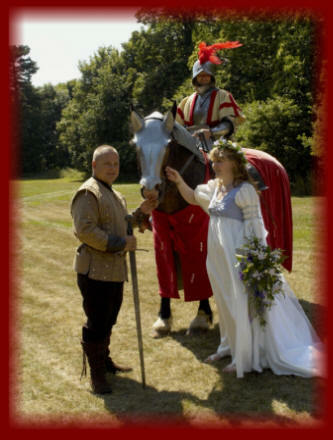 As they were processed over the hill towards their waiting guests by the Minstrels and by a gallant knight on horseback and men at arms they began to realise their dream day was indeed becoming a reality. 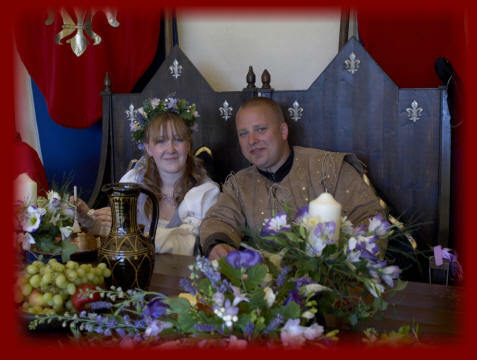 With one of Fantaysia's grand medieval tents and set out with heraldic top table pottery adorned with thrones and medieval flags, as the setting of their day it had all just begun. Fifty Lords and Ladies were then indulged to hands on falconry, medieval ales, mead and wines from The Kingdoms Black Rat Tavern served by wenches. Ladies favours were taken from fighting knights, a banquet fit for a king and medieval music to sooth the wildest beast. The Royal jester juggler amused and bemused them with his bed of nails and his juggling fetes. Merlin amazed the guests with his magical table top skills. The guests were entertained through out the reserves. Their guests also learnt medieval dances from medieval times. 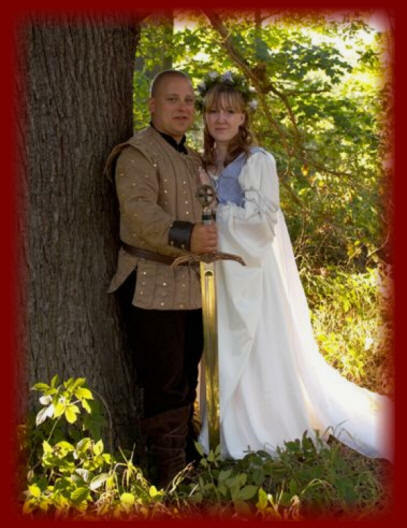 The most romantic part was their forest Celtic ceremony which they exchanged love knots and drank from a goblet surrounded by candles. Joined for ever more till the end of time. It had been a fantasy of Lady Samantha , the Robin hood films and story and they wanted to feel as though they has experienced a little of what it was like. Colin dressed the part to be her Robin Hood for her special day and they are a wonderful couple and had a day they and their guests will never forget. Samantha's father came to the princess and commented he was in awe of all he saw and that it was so amazing the amount of detail that had been taken to make it the way it all was. Colin and Samantha were so overwhelmed and couldn't stop thanking Princess Valaria for making their day come true. So hello all young lovers where ever you are your dream day is just a phone call away!